Why not? Having committed almost half my life to the mission of BBBS “I’m all in”. So, when the opportunity to be all in in a literal sense came about I didn’t hesitate. Every day the volunteers and children in our program take a leap of faith. They trust that myself and the rest of the BBBS staff are going to do everything in our power to provide them with a wonderful, empowering experience. They “take the plunge” every day. 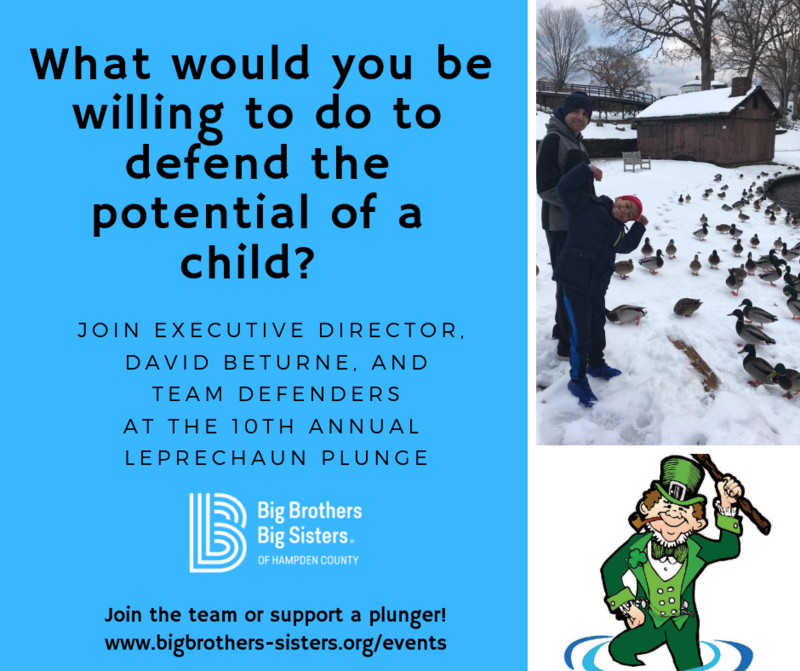 Participating in the 10th annual leprechaun plunge is a fun and unique way for me and the rest of The Defenders to showcase BBBS and the amazing impact it has. Every child has the potential to do great things and I am willing to plunge into the icy cold CT River to bring attention to the fact that there are hundreds of children in Hampden County who need and want the care and guidance of a Big Brother or Big Sister.